A reward scheme that offered children in a Highland hospital vouchers for a fast food chain has been withdrawn. The McDonald's tokens were given out on an occasional basis at Raigmore Hospital in Inverness to youngsters who had been "brave" undergoing treatment. 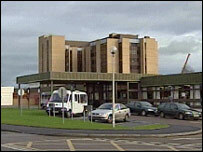 NHS Highland said the reward scheme had been in place for a number of years without any review. The vouchers were dropped after the health board agreed the practice was "totally inappropriate". NHS Highland chairman Garry Coutts said: "I appreciate that the thoughts behind the scheme were to reward children who are sometimes undergoing painful and lengthy procedures, but there are other ways we can do this. "As soon as it was raised with senior managers and directors it was stopped and I would like to thank those people who brought it to our attention." Should the hospital offer McDonald's vouchers? McDonald's, which has sponsored family accommodation in the children's ward, said it regretted the move insisting that the voucher was attached to a bravery certificate and used with the consent of parents. Green MSP for the Highlands and Islands, Dr Eleanor Scott, said: "I very rarely criticise the NHS, but in this instance I really do think something has gone very badly wrong. "This practice of encouraging children to eat highly-processed food, likely to be high in salt, sugar and fat, should stop immediately." The former community paediatrician said: "Giving out vouchers for McDonald's will simply make the so-called ticking time bomb of obesity even bigger and more explosive."